Evey day, Arab kids play soccer on Judaism's holiest site, the Temple Mount. According to Islam, its also the 3rd holiest site to Islam. 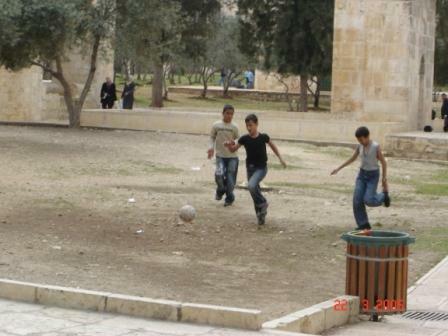 So why are these Arab kids playing soccer there? Waqf only care about Jews praying on the Temple Mount, nothing else is considered a desecration. Even if it is a desecration of Islam's holy site, at least it sticks it even more to the Jews. Kids playing soccer have parents in the Waqf, Palestinian Authority, Fatah Central Committee, or have weapons with lots of ammunition. Kids hold from the Israeli Chief Rabbinate's prohibition of going to Temple Mount; didn't think they would be caught on camera. Yossi Beilin: Its only soccer, at least they aren't throwing rocks. Kids will be kids. Barry Chamish: Its not soccer, its midget aliens preparing the landing location for a UFO mother ship. Its not really an Islamic holy site to being with. For those not familiar with the situation on Har HaBayit, and I hope to blog about that soon, its the only place in Israel, where by Israeli law, it is forbidden for Jews to pray there, so as not to offend the Arabs. While the subject of acsending Har HaBayit is a very complex halachik question, there are many rabbis who permit ascension under strict guidelines of preparation (mikva) , actual ascension (no leather shoes), and path of travel (so as not to stray into forbidden areas). This used to be a totally hands-off topic to Orthodoxy, but in the past few years, there is a large awareness campaign of ascending Har HaBayit, according to halacha. Its a very serious issue (doing it wrong/improperly can lead to the heavenly punishment of "Kareit") -- and thousands of Jews now ascend every year, b'tahara (in purity) and according to halacha. Only recently has the Israeli government (under the brave decision pushed by MK Tzachi Hanegbi - while I may disagree with him on many issues, I have to give him credit for this) changed its position that Jews should be allowed to ascend to Har HaBayit. Yet, they still stipulate that no "incitement" take place; anything that annoys the Waqf is not permitted. Therefore, it is forbidden for Jews to pray on the Temple Mount. Moving your lips in a quiet murmuring of the Shma, tehillim, or any prayer whatsoever is grounds for immediate forceful eviction from the Temple Mount by the Israeli police. Once thrown off Har HaBayit you can be blacklisted from ever entering the compound of Har HaBayit again. I have a picture somewhere that I need to find, of a Jewish woman being dragged off of Har HaBayit, with a policeman's hand clamped over her mouth to prevent her from continuing to say (quietly, to herself) the Shma. No Jewish prayer permitted, just Arab kids playing soccer. Found the following from a fellow blogger -- better to go straight to his site; its got pictures and all. Historic Find from First Temple Period! Ancient Telegram from the past -- "Hi! We're here waving at you - its us!" As the Palestinian Authority and Waqf do everything in their power to destroy any trace of Jewish History on the the Temple Mount -- an amazing historic relic has been found. Going back a few years, under the Ehud Barak government, the Palestinians were in the middle of building one of the world's largest mosques -- underground, on the Temple Mount. Not wanting to upset the Palestinians during his attempts to come to a "peace agreement" with Arafat, Barak ignored the massive excavation of the Temple Mount. 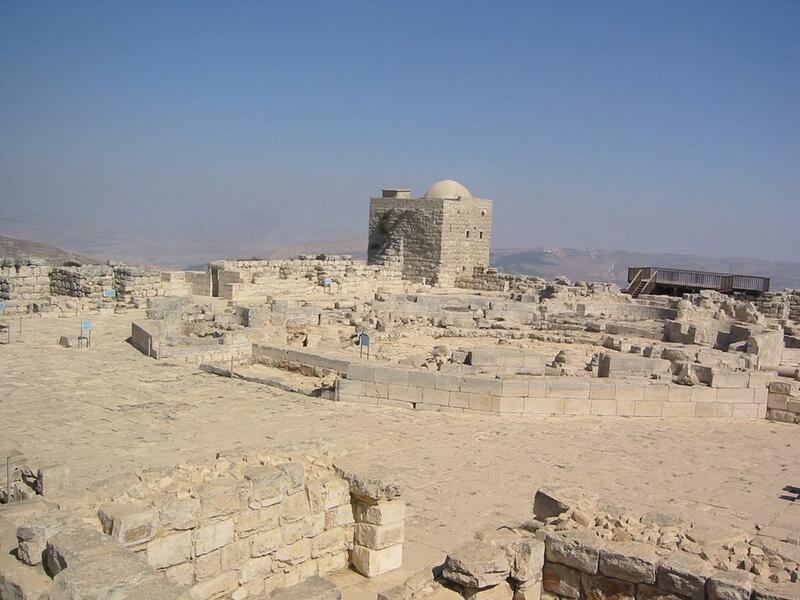 This archeological "crime of the century" was largely ignored by the Israeli government, despite the warnings from Israeli chief of antiquities authority, Amir Drori. The Palestinians destroyed whatever archeological evidence they could find that proved the Jewish Temples once existed. Arafat often told Bill Clinton that there never existed a Jewish Temple at that location. (see Ross interview; Dennis Ross, Yasir Arafat, Foreign Policy, (July/August 2002). The Palestinians dumped hundreds of trucks worth of "landfill" from the Temple Mount at the base of "Ir David", the city of David, just south outside the walls of the old city of Jerusalem (known as Silwan in Arabic). Never before was any archeological work done on the Temple Mount, and for the first time, real earth from the Temple Mount was now "outside" the walls of the Temple Mount compound. However, adding insult to injury, as Jewish archaeologists ran to the site to see if they could recover any artifacts, they were promptly arrested by the Israeli Police. Their crime was "illegal archaeological work." Never mind that the police ignored the illegal excavations on the Temple Mount by the Arabs, never mind that the earth was "pre-searched" and everything the Arabs could find, destroyed, but the trucks were dumping the landfill in a garbage dump. Eventually, the Police gave up arresting people for sifting through the dirt and went on to much other more important tasks. Here are more pictures of remnants of the Jewish Temples that were dug up (some were destroyed) by Palestinians. Hot on the heels of their successful Qassam rocketeering campaign, the Hamas "activist" movement is adopting new methods to kill and torture Jews. Why just shoot missiles, when you can kidnap, videotape, torture and kill Jews for fun and profit? They say that since Israel capitulated and ran away from Gaza under Sharon's unilateral disengagement, its only logical that the more brutal and sadistic they act, the more likely that Israel will run away from the West Bank. Actually - you don't even need to only run from the West Bank. Last Friday, kibbutznikim were running away from their homes under a barrage of Qassam missiles . Thanks Sharon. Any more successes and there won't be much left. Last night an IDF propoganda missle exploded near the Israeli city of Sderot. The IDF leaflets, written in Arabic contained warning of death and destruction for those who live in areas where Qassam missles are launched from. Apparently the wind blew the leaflets from Gaza to Sderot. BATON ROUGE, LA. - The White House announced today that President Bush has successfully sold the state of Louisiana back to the French at more than double its original selling price of $11,250,000. "This is a bold step forward for America," said Bush. "And America will be stronger and better as a result. I stand here today in unity with French Prime Minister Jack Sharaq, who was so kind to accept my offer of Louisiana in exchange for 25 million dollars cash." "Jack understands full well that this one's a 'fixer upper,'" said Bush. "He and the French people are quite prepared to pump out all that water, and make Louisiana a decent place to live again. And they've got a lot of work to do. But Jack's assured me, if it's not right, they're going to fix it." "Shuba-pie!" said New Orleans resident Willis Babineaux. "Frafer-perly yum kom drabby sham!" However, President Bush's decision has been widely lauded by Republicans. "This is an unexpected but brilliant move by the President," said Senate Majority Leader Bill Frist," instead of spending billions and billions, and billions of dollars rebuilding the state of Louisiana, we've just made 25 million dollars in pure profit." "This is indeed a smart move," commented Fox News analyst Brit Hume. "Not only have we stopped the flooding in our own budget, we've made money on the deal. Plus, when the god-awful French are done fixing it up, we can easily invade and take it back again." The money gained from 'The Louisiana Refund' is expected to be immediately pumped into the rebuilding of Iraq. Since Friday, the Qassam rockets have continued falling on Israeli towns in the Western Negev. Over 40 were fired on Friday and Shabbat, and 11 people were wounded. Many bloggers around the world have been stating what a great success the disengagement has been. Since the Hamas announced its cease fire, they haven't stopped firing rockets. The Hamas/PA agreed to so many ceasefires over the past 4 years that its laughable that anyone actually pays any attention to their press releases. Since I started thinking about writing about the great success of the disengagement, another Qassam rocket has just hit Israel, this time in "or Haneir". Since you've probably never heard of this town, I'm posting a map. Real people live there, and its a real terror to have rockets shot at you. I can't even hit the publish button, and the Jordanians have started preaching to Israel to "Stop its aggression towards the Palestinian people". Thats it. I'm off to vote for early Likud primaries. 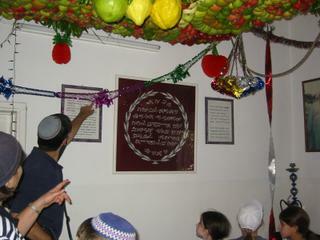 A Shomronim "mezuza" -- a pasuk from the Torah hung on the wall inside the house. Guess I shouldn't call it the "Torah" because its not really the same as Judaism's. Well maybe the same, but they are a different religion. Living on Har Greizim, overlooking Shechem lives a small community of the Shomronim/Samaritans. Since this topic came up on a different blog, I decided to write a quick summary of my trip their last sukkot. They don't live that far from the Muqata -- and it was easy getting there. Well, easy if you carry an M16, and have rock-proof windows, but I don't consider that a big deal. There are 2 communities of Shomronim living today in Israel; one community in Holon (near Tel-Aviv), and one on Har Greizim, overlooking Shechem. Next door is the Jewish town of Har Bracha, and there isn;t that much interaction between the 2 communities. One's Jewish, one's Samaritan -- yet its eerie that there can be so many familiarities between them, yet they are still different religions. The Shomronim community in Holon wishes it could integrate more with Israeli society, and say they are part of "Adat Yisrael" -- but they aren't Jewish, and it just causes problems of intermarriage (as if we don't have enough problems in Israel as is). Har Greizim actually has 2 communities on it [not including the Jews living in the town of Har Bracha, a seperate part of the hill] -- the Palestinian (Area A!) and the Samaritan community (Area C). Here's a view of the Palestinian side from the Samaritan side. The large building is just a big house. He showed us his "sukka". A Samaritan "sukka" is indoors, and consists of a latticework with fruit hanging off it. 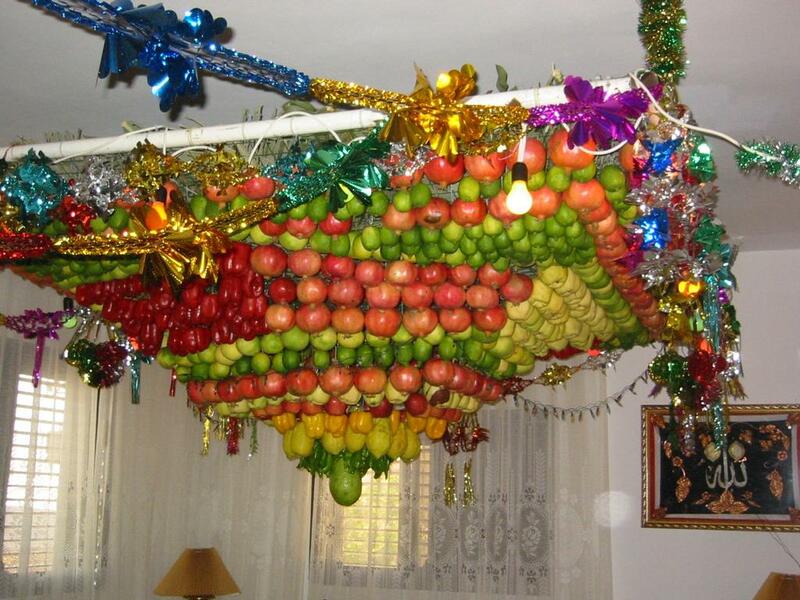 The fruit is arranged in square/rectangular geometric patters -- usually with etrogim int he middle. It smells amazing. Anyway - thats enough on the Shomronim for today. Back to regular Muqata reporting in our next post. 3. The previous Israeli MK and Energy Minister, Gonen Segev was supposed to get a vacation from prison. Someone in jail apparently got hold of his real vacation plans, and he also planned to skip the country (maybe to join Dan Cohen?). Prison Authorities have cancelled his vacation plans until further notice. Gonen Segev is in jail for 5 years for drug smuggling tens of thousands of ecstasy pills to Israel, and using his diplomatic passport to facilitate his smuggling operations. His real claim to fame though, was being the 61rst MK to support the Oslo process, giving the much needed majority to Rabin and Peres in 1995. They gave him the energy ministry and a Volvo so that there would be enough Jews and Arab MKs to obtain the massive majority of one in the Knesset. Thousands of dead later, and out of politics, he went into the next logical business after chasing Israeli Leftist ideology - drug smuggling. The Last Jew [remains] in Gaza. A Jewish woman, Miriam married an Arab in the early fifties. She had moved to Israel from Libya, and then, while hanging out in El-Arish in Egypt, she met and married Rajik Al-Chalak. They lived in El Arish, and her husband was coaxed into joining the Israeli "Shabak" (secret service). When Israel left the Sinai, the family moved to Dahaniya in the Gaza Strip. Miriam died a few years ago, and was buried in the Dahaniya cemetery. Most of the Arab families living in Dahaniya were agents for Israel and right before the "disengagement", the majority were relocated to other parts of Israel -- for fear of brutal retaliation by the Palestinians. The Imam of Dahaniya required that the mosque of Dahaniya be destroyed, to keep it from being defiled by the Palestinians. Yet Israel ignored the request to move the bodies from the cemetery. Reports from Gaza say that the Arab cemetery has been bulldozed and destroyed, and the bones of Miriam are strewn around. pictured here - Dahaniya in the Gaza Strip, cemetery circled in red. An Israeli firm ran out of the UK last week, faster than Sharon fleeing Gaza. They had a stand at the annual Defence Systems and Equipment International (DSEI) exhibition, held in the UK last week. Apparently, they were showing off electronic zappers and leg-irons, which are considered illegal torture devices in the UK. While I don't have an opinion on these particular devices, I found it very indicative of Israel in general. What? A torture device? We don't torture anyone here. What's the big deal...If we can throw teenage girls into jail for weeks for the crime of passive civil disobedience, then who the heck cares if we zap 'em also. Many fellow bloggers have sent me email about the "alleged" scandal brewing against Ariel Sharon. They say that in that in the remaining hour before he returned back home to Israel from the UN this week, he attended a gala campaign fund-raising dinner at 10,000 per couple. Yes, the Israeli campaign solicitation laws prevent personal donations of more than $3000/person, but as a member of the Likud Central committee, I'm loathe to believe that Ariel Sharon would stoop so low, as to illegally raise funds for his upcoming campaign. I'm sure that a man of Ariel Sharon's integrity, if he did in fact attend such a dinner, and if in fact, it cost $10,000 a couple, had nothing to do with any illegal activities. If any money was raised, I'm sure it must have been for the Gush Katif refugees he expelled from their homes. The spare change will go to the Katrina refugees. Relating the statement (Muqata Quiz #2) below on the abuse of Human Rights, to throw someone out of their home -- it was written in a judicial ruling by none other than Israel's foremost judicial activist, Chief Justice Aharon Barak. It wasn't a lament on the sorry state of the Gush Katif refugees, rather, his legal opinion (and judicial ruling), negating Israel's (the IDF's) right in 2002 to deport a terrorist from his home in Judea/Samaria to the Gaza Strip. Supreme Court Case 7015/12 "Kifach Muhamad and Ahmed Ajury vs Commander of IDF forces"
This is a clear example of how people who act kindly to the evil, end up being evil to the meek. Then again, its only a hop, skip and a jump from forbidding the expulsion of terrorists, to throwing Jews out of their homes, to allowing the destruction of synagogues. The Muqata quiz will return soon. The basic starting point, in which removal of a person from his domicile, and forced transfer to a different location severely impacts his dignity, his freedom, and his property. A person's home is not just a roof over his head, but a means of physical and social attachment to a locale, [including] a person's private life, and social cohesiveness. A number of basic human rights are impacted by transferring a person against his will to a different location, even if the transfer does not cross an international border. The origins of these human rights are partially based on internal law of different countries, and partially anchored in the norms of international law. Which flagrant anti-disengagement activist wrote the above? Email or post your answer in the comments section. Muqata Quiz: Who said the following? "After we saw and experienced the difficult scenes of the expulsion of Jews from Gush Katif, the Northern Shomron, the destruction of houses, and above all, the burning of the synagogues, one can say that even the State of Israel, and not only the United States, has its own 9/11. For the US, it is a national day of tragedy, and by us [in Israel] it will be remembered as a national day of embarrassment -- it should be remembered on this day, every year in the State of Israel." Be the first correct blogger to post a comment who said this, and you can decide the next topic to be written about in the Muqata. This shocking headline was reported on Israel Radio channel 2 (Reshet Bet) today, and appeared on their web site. I had read this earlier on the debka website http://debka.com/headline.php?hid=776, but normally read their reports with a grain of salt. However, when the same story appears on Reshet Bet, is more than a bit worrying, though I can't say that this information is surprising. Since the Reshet Bet story was so shocking (and bound to surprise quite a few Likud Central committee members), its probably not going to be on-line much longer. Here's a link to an unedited screenshot of the news report. The report also mentioned the following weapons transferred to Gazastan: long range Katyusha rockets, anti-tank weapons, anti-aircraft weapons, and hundreds of thousands of AK-47's -- which are destined to change the balance of power in the region. All of this occurred last week when the IDF ran out of Gaza. 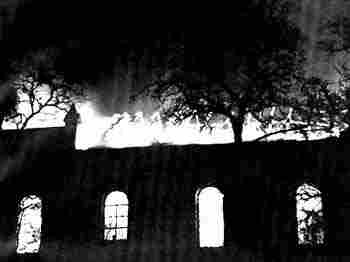 First the synagogues were ransacked and destroyed by Palestinian Arab mobs. Second, the remaining Gush Katif greenhouses that were supposed to provide additional livelihood for the Arabs -- were completely razed by the same mobs. Needing an outlet, the crossed the border into Egypt and started a massive weapons transfer program, bringing in everything they could from Egypt into PA controlled Gazastan. Of course, the PA and Egyptians were supposed to prevent that from happening, as Sharon and company promised the Israeli people. Ooops, we interrupt this blog to bring you a newsflash: 13:29 Israel Standard Time, Palestinians open fire from PA controlled Gazastan (Erez area) on an IDF armored personnel carrier in Israel. No reports of injuries. Where's the IDF powerful response that Sharon promised? Probably figuring out which caliber spitball to use. Just got back to the Muqata after a week in the US on business. You can only imagine what sort of business we in the Muqata have to take care of, but that's another story. 1. In Al-Funduq this evening, 3 Jews were injured by (Arab) rocks thrown at their car, smashing the windshield of their car. One was transported to the hospital and is in fair condition. 2. 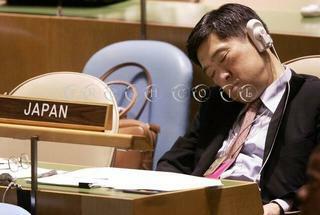 Sharon spoke in the UN today. I'm surprised he spoke in Hebrew (which I grudgingly have to give him credit), yet his speech was an election speech to the Likud. Some say that's the reason he spoke in Hebrew in the first place. He spoke about that the Land of Israel is exclusively that of the Jewish people, and no other. Too bad he never said that back here at home. Instead he used words like "occupation" instead of "historical right of the Jewish people." I'm not impressed - it was very cynical. 3. Spoke to Joesettler this evening. He said I sound very angry on this blog. Could be. Its unfortunate I have to write from the Muqata, but Israel's police aren't very liberal when it comes to freedom of expression. (unless of course, you're a leftist). 4. Lots of Hashgacha pratit. I needed to raise money for a family of Gush Katif refugees. By the way, none of them have received anything financially so far (like the 50,000 NIS "advance" payment on their compensation - none of that has arrived). Yesterday in shul on my way home, I mentioned this to someone, and before I left, he gave me a rather large sum of tzedaka which will be very useful for the refugees. In fact, it made my entire business trip to Chutz Laaretz seem worthwhile. Lastly: I have been thinking about this alot lately, and read about it elswhere on the web the other day. Picture the following; a huge tsunami crashes into the Gaza Strip. When the water receedes, there's nothing left there. No people, no buildings, no rubble. Just empty plains of sand...waiting for the Jews to rebuild it. It would explain many things (including why we had to remove the cemetaries from Gaza). It would explain why all the prayers were answered with a "no." I have a feeling that the events of the past months will become obvious and clear to us (as did the story of megliat esther) in the coming months. Shabbat Shalom from the Muqata. MDA and the Red Magen David - An Obsolete Symbol? The International Red Cross, and Red Crescent Organizations are considering for the first time in history, accepting into its ranks, Magen David Adom, Israel's national emergency medical organization. 1. MDA needs to part with its symbol - the Red Magen David. (Star of David) and accept the "internationally accepted" Red Cross and Red Crescent symbols. 2. MDA emergency workers will not be allowed to carry weapons of any kind. Unfortunately, the MDA is seriously considering the offer. They don't see the importance of the actual symbol; the bottom line is saving lives. Carrying weapons? Reduction of personal safety of MDA medics is a small price to pay, considering the honor of being part of the Red Cross and Red Crescent. As a volunteer MDA EMT medic and ambulance driver, I'm appalled by this announcement. I carry a weapon for self defense; MDA ambulances are stoned countless times by Arabs (even when going to help them), and its suicidal to drive in parts of Israel and Judea/Samaria without a handgun for self-defense. Lets start a poll - please let me know if you think its the right thing to do to forgo the symbol of the Magen David Adom, the Red Star of David, and the right to carry a handgun for self defense, in exchange for acceptance of the International Red Cross and the Red Crescent. If MDA would accept this, I would not want to volunteer anymore for an organization, so embarrassed of its Judaism. For our guests from the State Dept. Do you enjoy these before & after pictures? Wishing a very nice day to our guests from Washington DC. One of the nice features of the "site meter" at the bottom of this blog is the ability to see where our viewers hail from on planet Earth. While I don't generate as much traffic as fellow bloggers The G-dolHador, Dovbear, OrthoMom and Joe Settler, someone at the US State Department has started regularly viewing this blog. I'm not a big fan of the US State Department policy, which forces its opinions and policies on the US Executive and defines Foreign Policy in a way not consistent with the US Legislature. Its pro-Arabist stance can be seen in policies ranging from refusal to allow the Executive branch to implement Legislature approved policy of moving the US embassy to Jerusalem, or even writing the country "Israel" next to the word "Jerusalem" on the Birth Certificate of Foreign Born Americans, who were born in Jerusalem. They were born on planet Jerusalem -- with no country, because of US State Department policy. The US Congress overwhelmingly supports Jerusalem as the capital of Israel, yet the State Department has its own agenda. I don't blame the current and previous Secretaries of State - for the most part, I believe that Rice and Powell were truly revolted by having to deal with the Palestinian Terrorist Organizations, Palestinian Authority, and their henchman. They probably revile in the handshakes of Muhamad Dahlan, the current "PA Minister of the Interior", who masterminded the RPG attack on the Gush Katif school bus, in which 2 people were killed, and the Cohen children lost their legs. However, for the US State Dept. to bend over backwards to protect the PA is abhorrent. Just 2 weeks ago, an America family from Israel, who's children were murdered by PA terrorists, won a court order freezing all PA assets in the United States. However, you can be sure the US State Dept. will ensure they never collect a dime. During the midnight hours, mobs began swarming onto several formerly-Jewish areas even before the last Israeli soldiers had left. This, despite the fact that PA officials had said they would attempt to prevent entry of Arabs to the newly-abandoned areas, and declare them "closed military zones." They mobs poured into N'vei Dekalim, Morag, Kfar Darom and Netzarim, setting out for the synagogues and trying to burn them down. The buildings are mainly concrete and therefore did not catch fire, but black smoke continues to darken the skies above the former Jewish towns. 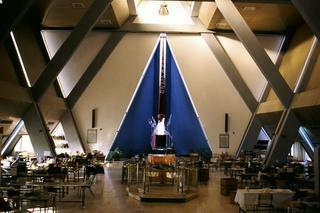 The IDF had hung orange signs on the 21 synagogues in Gush Katif, declaring them a "holy place." The United States, which takes credit for disseminating the concepts of freedom of religion and respect for religious sites, condemned Israel for its decision not to destroy Jewish places of worship in Gaza. "The decision places the Palestinian Authority in a no-win situation," said a State Department spokesman. What exactly is the no-win situation? While the United States is based upon the pillars of religious freedom, why does the State Dept. believe that Palestinians do not need to be held to the same moral standard? In fact, even if the Palestinians were burning churches, the State Dept. would probably have raised the same comment. US State Department policy is an embarrassment to morality, the Constitution, and American Democracy. The US State Department blog lurkers are free to comment; unlike the Palestinians they pander to, I won't delete their comments or threaten their freedom of religion, free speech, or their pursuit of Life, Liberty and the Pursuit of Happiness. Night of the Burning Shuls - Take 2. The Sharon family, in its haste to make Gaza Judenrein for PM Arik's visit to the UN this week, decided to only partially listen to what all religious Jews have been saying. They demanded that Israel not destroy the shuls. They also demanded that Israel find a third party to secure the shuls so that the Palestinian animals wouldn't do what they are doing this evening. But Sharon doesn't care - he wanted to leave Gaza as quickly as possible; shuls destroyed or not, its not his problem (nor does he honestly care). Please note - just prior to leaving, the IDF affixed clearly marked signs to each shul in Arabic and English, so that there would be no confusion that these were holy places. As the Palestinian vermin burn the shuls, I'm still content that we did not destroy the shuls ourselves. For when Jews destroy shuls, it only lowers the bar for future (G-d forbid) anti-religious acts on behalf of the Sharon family. This isn't the first time the Palestinians have rabidly destroyed Jewish buildings. In fact, Arabs have a rich history over the past 100 years of anti-Semitic fervor rivaled only by the Nazi's themselves. A few good examples are the horrible pogroms in Eretz Yisrael in 1929 and 1936. The destruction of the Jewish Quarter of the Old City of Jerusalem from 1948 to 1967, and the use of Jewish tombstones from the Har HaZeitim cemetery to pave roads. Just a few years ago, in Shechem, the Palestinians rampaged against the yeshiva at Kever Yosef, the tomb of Joseph, burning it to the ground, and turning it into a garbage dump. Yet, there are so many deluded souls that think we have a future of peace with these animals. Sad...So sad...That these messianic religious fanatical leftists put their entire belief in the good will of such a bloodthirsty gang of butchers. Prior to the Disengagement, the most protected political person from the scales of justice was Ariel Sharon. The Israeli media refused to criticze him, investigate his corruption, for fear of preventing the Disengagment, and the expulsion of Jews from Gaza and the Northern Shomron. The media even gave him a new name -- The Etrog. 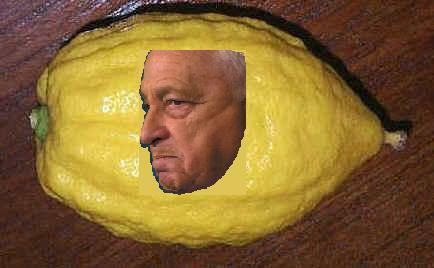 The same way an Etrog is lovingly protected before and during sukkot, so was Ariel Sharon protected and lovingly admired by the Media (and all justice). "In 2003, the Israeli Justice Ministry sent an official request to Austria asking for assistance. The request was rejected by an Austrian court for not detailing the bribery suspicions but only Sharon's alleged campaign finance violations, which do not constitute a crime in Austria. According to Austrian Justice Ministry Spokesman Christoph Pochinger, Israel astonishingly never made a second more-detailed request." In the final hours before the Israeli Government decides the fate of the shuls and yeshivot (Sunday Morning), I'm masochistically reminded of the gemara in Shabbat that discusses the melacha of "סותר על מנת לבנות" -- that you are only guilty of the primary melacha of destroying on shabbat, if the reason behind the destruction is rebuilding. Since the total destruction of the shuls in Gush Katif by the Israeli government is not for the intent of rebuilding, but rather for total that of destruction, eradication and decimation -- they could blow up the shuls on shabbat without being guilty of this melacha. Picture of Shul in Neve Dekalim after all residents expelled 3 weeks ago. 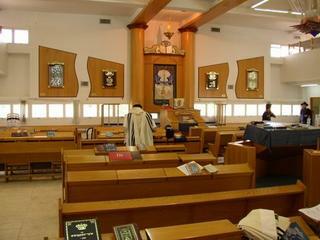 Picture of Shul in Neve Dekalim this week. I pray that Israel doesn't destroy the shuls in Gush Katif. After all, even when the Greeks and Romans were charging into Jerusalem, the JEWS didn't destroy the Batei HaMikdash. We didn't say, "better us than them". Yet there are so many confused Jews who don't understand this simple message. I guess 2000 years of Galut is enough to mess up any nation, and infuse many foreign ideals into their way of thinking. כה וְעַתָּה, שָׂא נָא אֶת-חַטָּאתִי; וְשׁוּב עִמִּי, וְאֶשְׁתַּחֲוֶה לַיהוָה. כו וַיֹּאמֶר שְׁמוּאֵל אֶל-שָׁאוּל, לֹא אָשׁוּב עִמָּךְ: כִּי מָאַסְתָּה, אֶת-דְּבַר יְהוָה, וַיִּמְאָסְךָ יְהוָה, מִהְיוֹת מֶלֶךְ עַל-יִשְׂרָאֵל. כז וַיִּסֹּב שְׁמוּאֵל, לָלֶכֶת; וַיַּחֲזֵק בִּכְנַף-מְעִילוֹ, וַיִּקָּרַע. כח וַיֹּאמֶר אֵלָיו, שְׁמוּאֵל, קָרַע יְהוָה אֶת-מַמְלְכוּת יִשְׂרָאֵל מֵעָלֶיךָ, הַיּוֹם; וּנְתָנָהּ, לְרֵעֲךָ הַטּוֹב מִמֶּךָּ. כט וְגַם נֵצַח יִשְׂרָאֵל, לֹא יְשַׁקֵּר וְלֹא יִנָּחֵם: כִּי לֹא אָדָם הוּא, לְהִנָּחֵם. ל וַיֹּאמֶר חָטָאתִי--עַתָּה כַּבְּדֵנִי נָא נֶגֶד זִקְנֵי-עַמִּי, וְנֶגֶד יִשְׂרָאֵל; וְשׁוּב עִמִּי, וְהִשְׁתַּחֲוֵיתִי לַיהוָה אֱלֹהֶיךָ. לא וַיָּשָׁב שְׁמוּאֵל, אַחֲרֵי שָׁאוּל; וַיִּשְׁתַּחוּ שָׁאוּל, לַיהוָה. Sharon and his family will forever be remembered by Jewish History for the מעשה חורבן they wrought upon Israel. 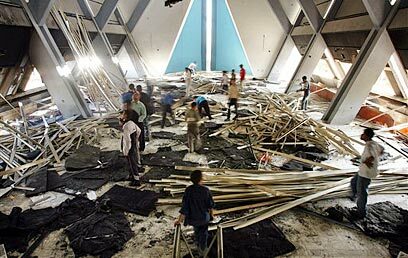 Destroying the Gaza Synagogues: Deconstructing Zionism. While the world worries about the US Katrina Calamity, far away from the limelight, a heated battle is going on in Israel concerning the destruction of the 22 shuls and yeshivot that remain in the Gaza strip. The government's intention was to blow them up and leave 154 public buildings standing for the use of the Palestinians. Yet, for the meantime, the Israeli Supreme Court is annoying the hell out of Sharon's plan. After multiple petitions to the Court from different Rabbis, the court has issued an injunction preventing the government and IDF from destroying the shuls. The court has requested from the government to examine the possibility of the buildings being guarded by the PA, or by a third party. The government asked the PA, who flatly turned down the offer, saying they could not guarantee the safety of the buildings, and were worried that PA ransacking of the shuls would give Israel the excuse to destroy mosques in Israel. Why is the Israeli government so concerned about the fate of these shuls? Does anyone honestly believe that this government is so worried about the fate of the physical structure of these buildings? Are they worried it will look bad for these shuls to be destroyed by their peace partners? Even more interesting is the fury of the Left at the very notion of keeping these shuls standing. They say that rightwing, messianic rabbis want to show the world (at the expense of the shuls) the evil of the Palestinians. The answer is very simple, yet no one wants to come out and write it. (so here it is). The Israeli Government and the Left want every shred of evidence of Jewish life removed from Gaza to prevent anyone from imagining that a return to Gaza will be possible. They want every last bastion of religion that could possibly connect Judaism to Eretz Yisrael to be removed. Kill the Dream of Return. This is the real reason they are terrified of leaving the shuls behind. Even if they were boarded up, and guarded 24x7, the government does not want anything to remain. Before I forget, the British have a WWI cemetary in Gaza which even has Jewish British soldiers buried there. Its gaurded, yet not destroyed. Maybe it is possible to leave shuls and cemetaries in Gaza? Of course its possible, but Israel wants all Jews out, alive or dead, including the shuls. Yet, the day will come, when we will return and rebuild. Maybe not me, but my children, or their children will rebuild the Jewish communities of Gaza. Hashavat Aveida - LOST IN NEVE DEKALIM. PLEASE DISTRIBUTE TO ALL LISTS -- LOST IN NEVE DEKALIM!!! Suitcase in which were 2 pair of Tefillin "Rashi" and 2 pair of Tefillin "Rabeinu Tam". Each set of Tefillin was in a separate small black (or navy) velvet bag, and all were in one larger bag, one side of which was material, the other clear plastic, with a long carrying strap. In addition, there was a U.S. passport and airline ticket for: Shmuel Y. Albukerk. Anyone knowing or hearing of said bag or contents please contact: 050-632-4428, and may Hashem reward your efforts. This coming Wednesday (Sept 7.) is the last day Gush Katif will be open for any civilian volunteers to help dissassemble the remaining Jewish owned greenhouses in what remains of Gush Katif. If you are able-bodied to do physical labor (in the sun) and help with this tremendous mitzva, please call (in Israel) 02-652-2582 or Ditza at 052-521-9389. 1. Help rescue the parnasa/welfare/economic livelihood of Gush Katif farmers. The amounts of financial compensation from the Israel government is not nearly enough for most farmers to restart their lives. Helping take apart (and reconstruct in Israel) these greenhouses, and shipping the remaining produce will be a huge financial boost for these farmers. 2. Anything leftover will be given to the Palestinians. The same evil Palestinian terrorists who proved to the world that "crime pays", do not deserve anything leftover from the Gush Katif expulsion, let alone greenhouses and produce of the Jews they tried so hard to murder. Math Lesson for Israeli schoolchildren: If it took the Sharon Family 1 week to expell 8000 Jews from Gaza, and one day for the US to evacuate 1,000,000 civilians from New Orleans, then how long will it take the USA & the Sharon Family combined to totally evacuate the entire State of Israel?